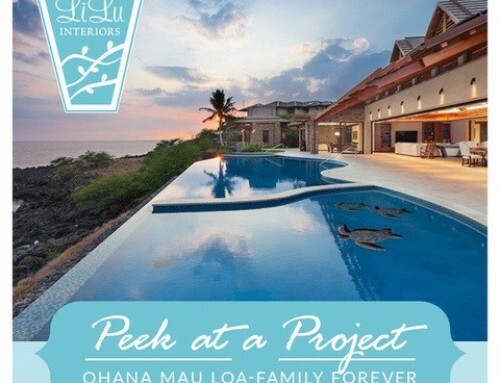 This weeks Peek at a LiLu Project is a special one. 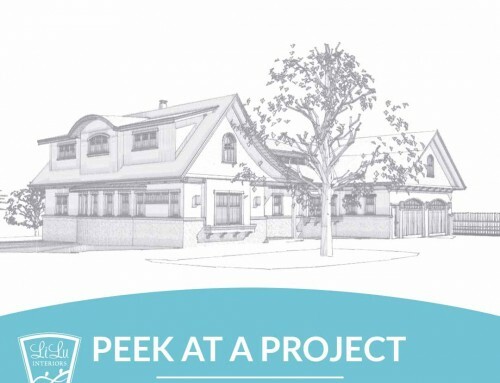 It involves a project where we volunteered our time and design skills to grant a wish for a very special, young boy through the Wishes and More charity. 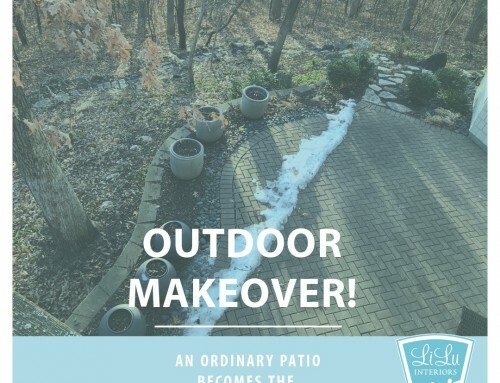 Wishes and More is a Minnesota based charity that enhances the life of a child fighting a terminal or life-threatening condition by providing extraordinary experiences including wishes, scholarships, memorials and more. LiLu has partnered with Wishes and More for several years as we help out each year at their annual Gala. Karla Blomberg is the Founder and President of Wishes and More. To say she has the most giving, generous and beautiful heart would be an understatement. Learn more about Wishes and more here and they are always looking for volunteers, donations and people to attend their events that they hold all year round! 9-year-old Ryan was born with a heart defect called Tertralogy of Fallot, a congenital heart disease. Ryan does not let this disease slow him down. He is a huge sports fan and plays quite a few sports himself. But Ryan’s true love is trains! 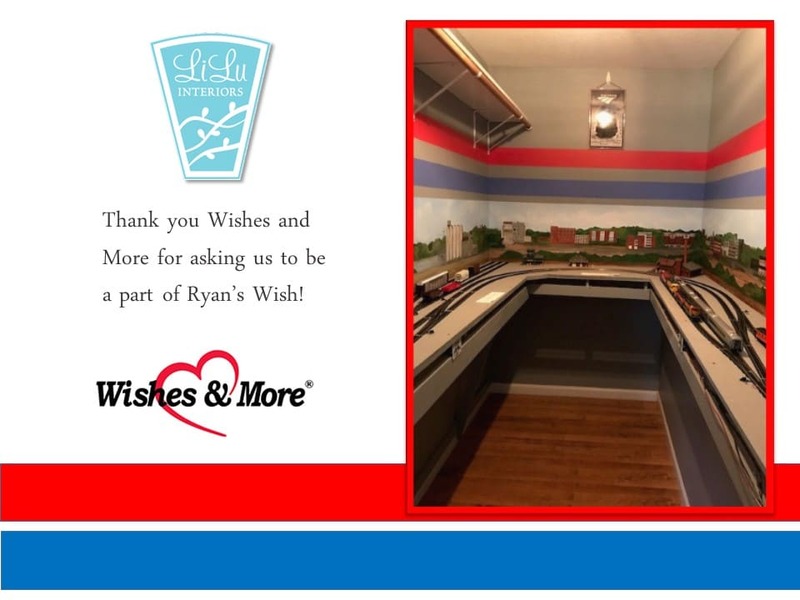 Ryan’s wish is for a train room in his home. Wishes & More approved this special wish and the plan was put in motion. 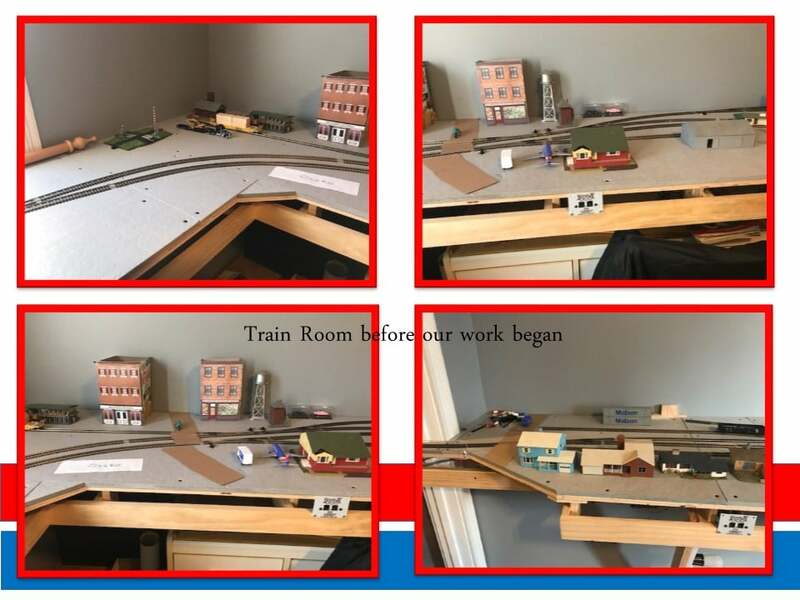 Ryan’s Uncle Dave, who is also a train lover and other train enthusiasts helped to assemble the special shelves needed. Ryan & Dave have worked together to put together the tracks. 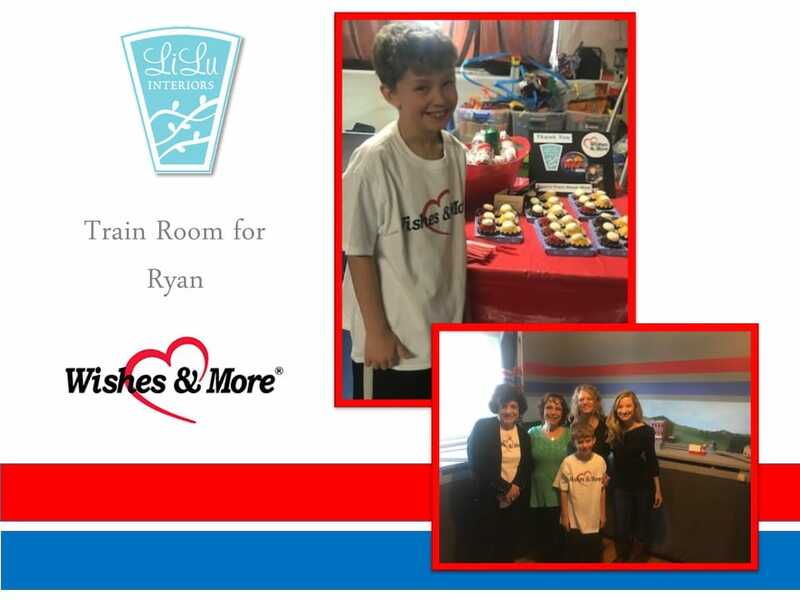 After we heard about the wish, we met with Ryan, his Uncle Dave and family and listened to their desires and needs for the train room. We took photos of the before space. 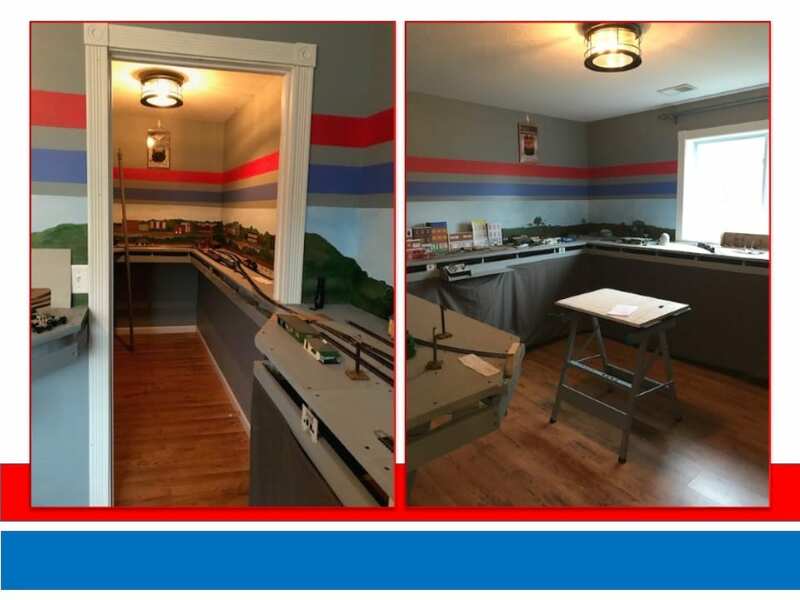 The Amtrack stripes had already been painted and the tracks constructed. 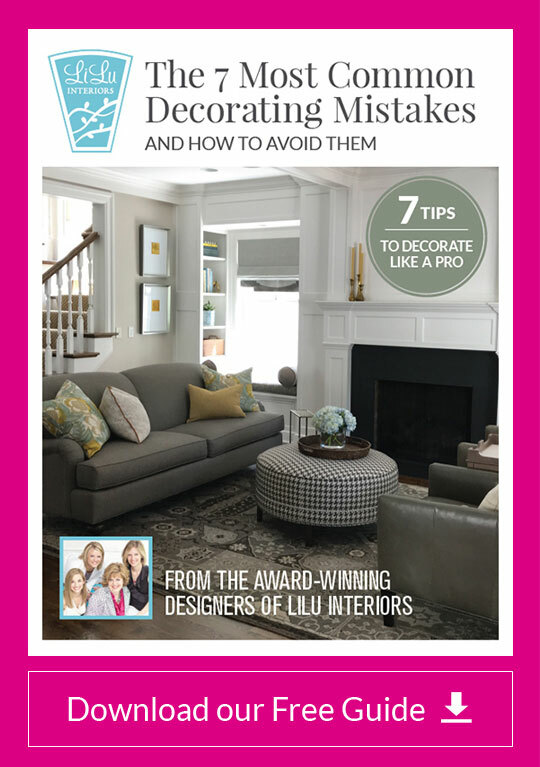 We couldn’t wait to add the important details to the space to help it come together. 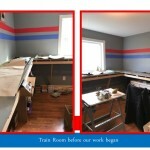 The next step to Ryan’s train room involves the details and thus in steps us here at LiLu. We all wear many hats and for some of us painting is a special one. 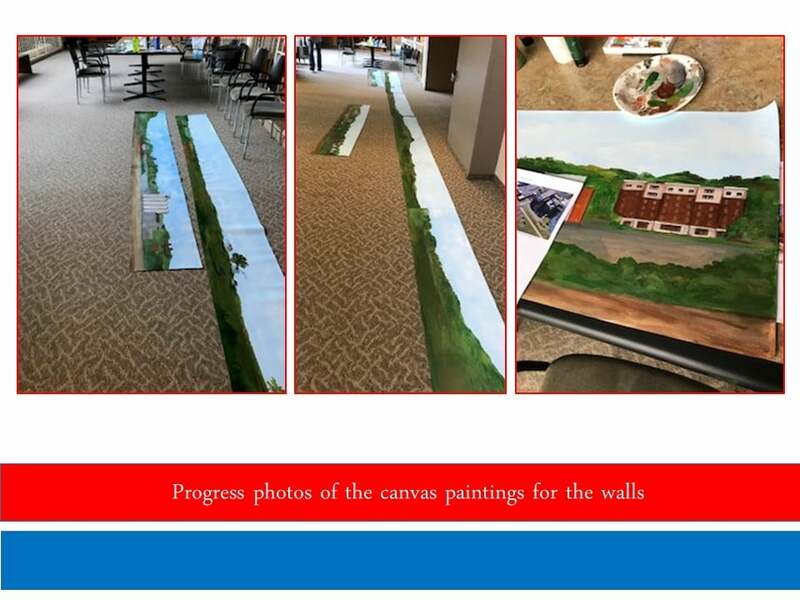 Jennifer and Ally set out to paint beautiful canvas panels that would be pasted on the wall to act the backdrop scenery to the railways. 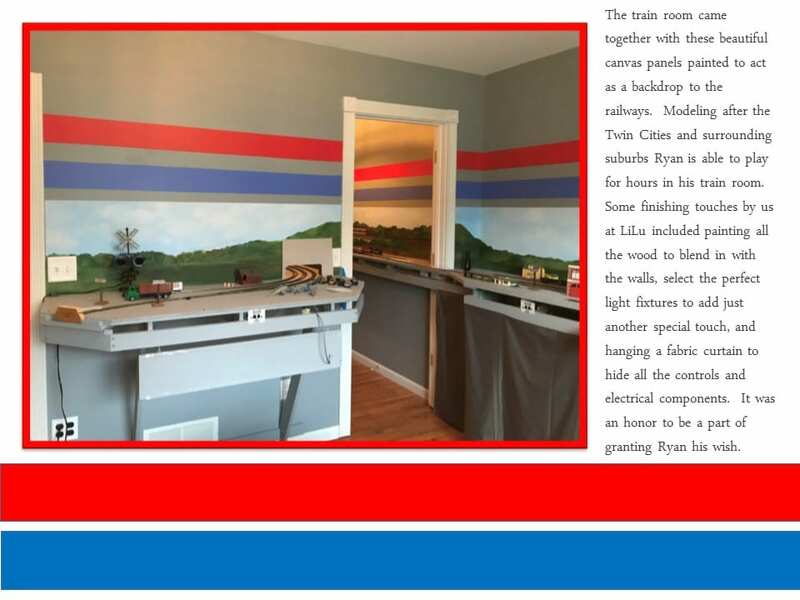 Ryan and his Uncle Dave created towns modeled after the Twin City Suburbs including Crystal, Osseo, Robbinsdale, Fort Snelling, Minneapolis Junction, Humboldt Yard and University. We gathered images and did our research of what the landscape looked like in these cities and then went to work. Below are some images of the panels all laid out at our studio space. It was no small feat! Installation day was a lot of fun. 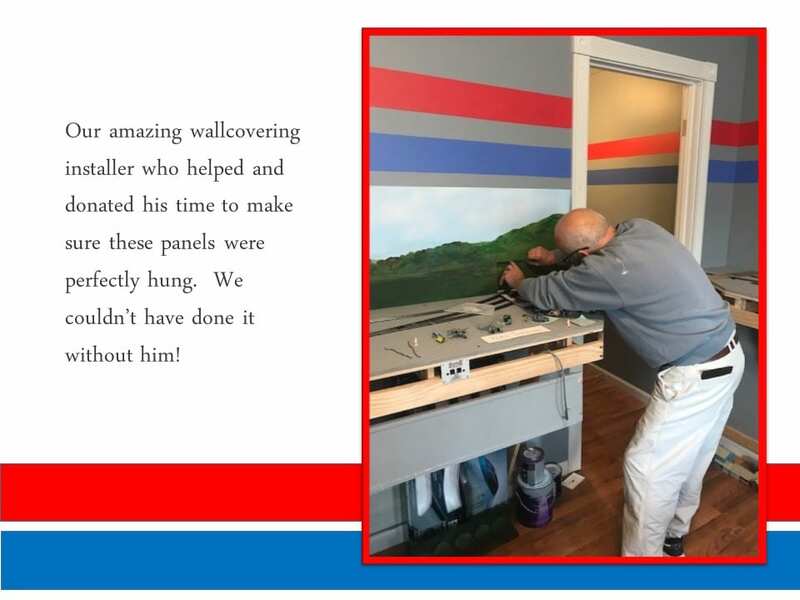 Our wallcovering installer came to help us out to seal the walls and carefully execute the installation. 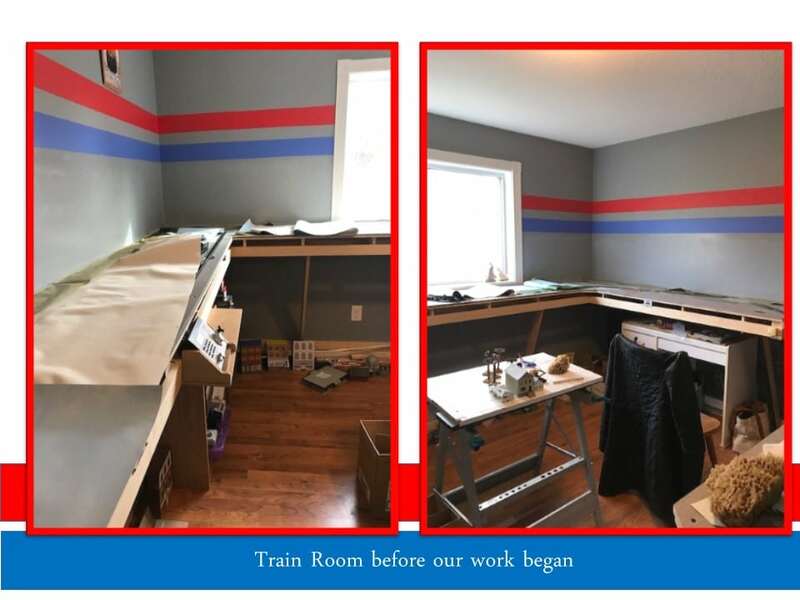 The rest of us helped clean up the room, painted the wood work to match and blend in with the walls, hung a fabric curtain to hide controls and electrical, and installed light fixtures to add to the old time train feel. 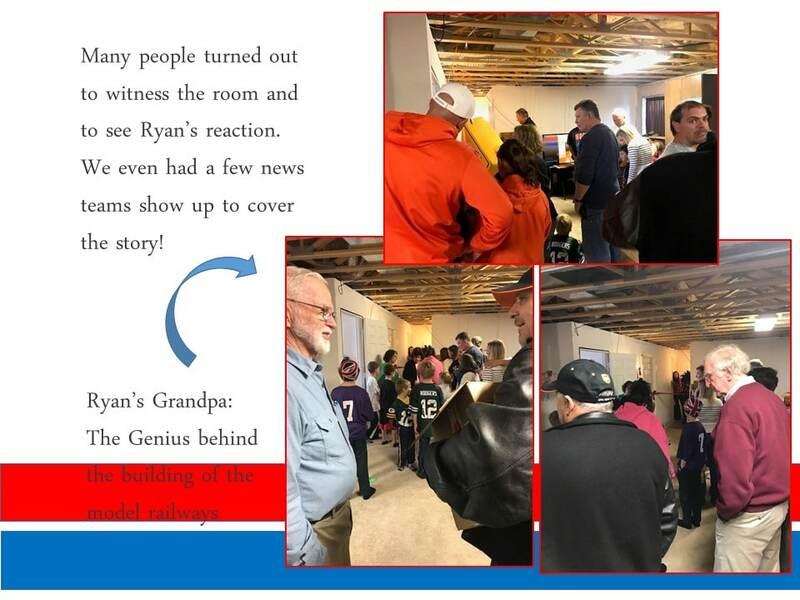 The day finally arrived for Ryan’s unveiling. Family, Friends, staff of Wishes and More and us all came to the event. A few news reporters came along to hear and report the story as well. 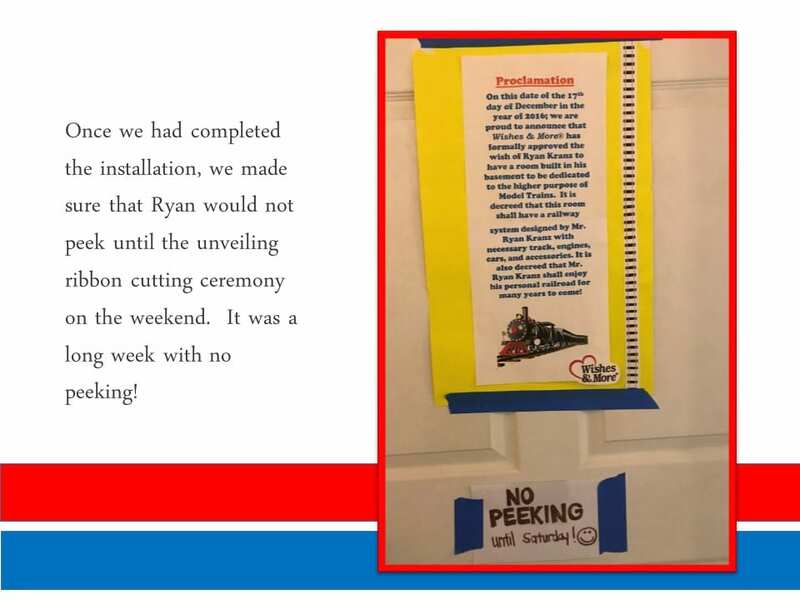 A few special guests included Canadian Pacific who helped underwrite the wish and BNSF who Ryan waves at each day as the train passes through his yard. 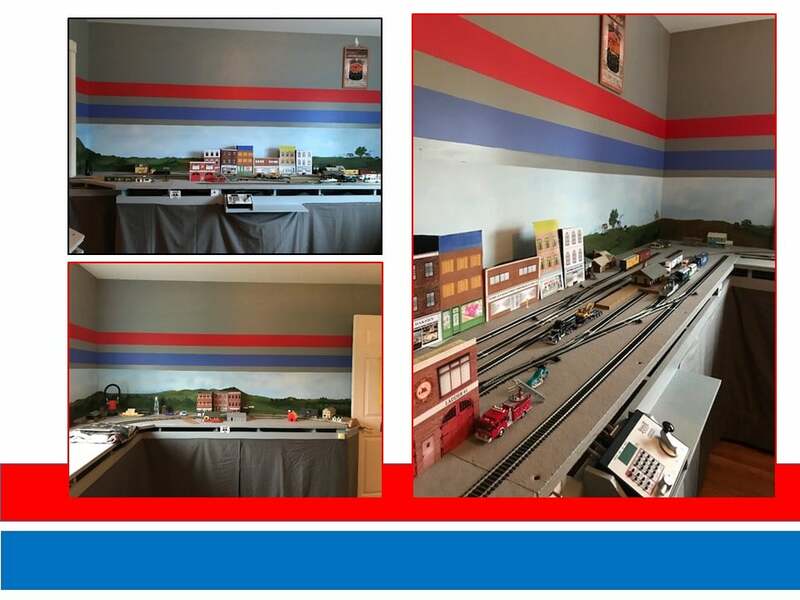 It was an entertaining evening and we thoroughly enjoyed seeing Ryan’s reaction to his complete train room. Final photos follow below. You can also listen and watch the story here from CCX media. 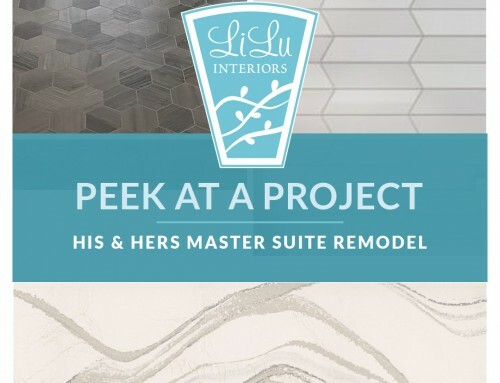 The train room project was a special one for us at LiLu. 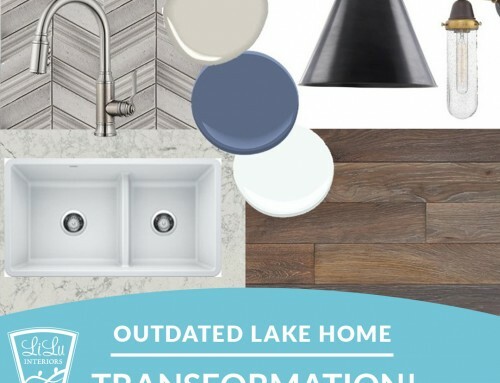 We are very intentional about the design work that we do and love to hear other people’s whys when it comes to designing a home or a space for them and their families. 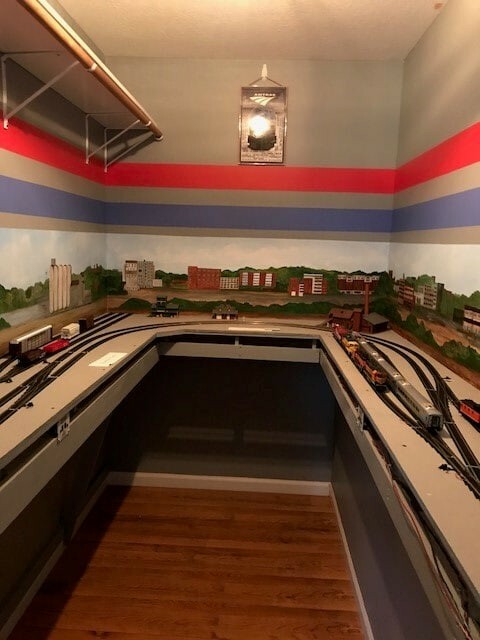 Trains provide a sense of calm to Ryan and we were honored to be a part of a project where we can help in creating a safe place for him especially when he is in a midst of bigger things that could overtake us all.